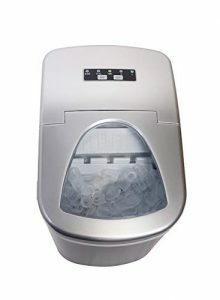 Stainless steel Prime Home Countertop Ice Maker (PHD-ICEMKR) is a sleek and modern machine that makes bullet shaped clear ice cubes within just eight minutes, for a total ice making capacity of 26 pounds in a 24-hour period. You can use the ice cubes in your cold beverages and foods. The average rating is 5 out of 5 stars by 11 customers at the time of this product review. 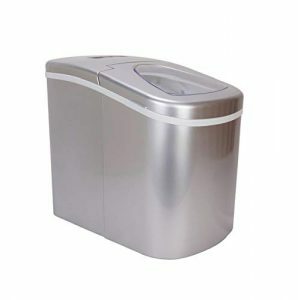 Prime Home is a fairly new release ice maker that is also one of the better selling models at Amazon.com. It is a compact and portable ice making machine that weighs 19.3 pounds and measures 9.5 x 12.9 x 14 inches. You can take it anywhere you want and use where there is a power outlet nearby. The small ice cubes are ideal for being pushed through the small water bottle openings and to be used in your mixed beverages. You won’t need to connect the ice maker to a water line as you just fill the water reservoir with fresh filtered water. You can use it in your home kitchen, basement bar, poolside parties, barbecues in your backyard and wherever you want. It is compact in size, lightweight, and easy to move and store. You can use it straight out of the box as there won’t be any need for installation. It comes with the smart features, with buttons and indicators. There won’t be any water or ice overflow as it comes with the warning lights and the auto shut-off feature that stops the machine when the ice basket is full. It will tell you when you need to refill the water tank. It has a 120-watt power compressor that runs quietly and efficiently. You will hear only the light ice dropping noise when it is in operation. The water tank has a 2.2-liter capacity and it is located just below the ice basket, which means the water from melted ice will be used for ice making. You will get a plastic ice scoop and a detachable ice basket in the package. With a stainless steel finish it appears to have a sturdy and durable construction and you can expect it to run just like new for many years. As a free standing ice maker you can put it on your kitchen counter, bar area or anywhere you want and will fit any decor nicely with its stainless steel- silver color. You can either use the ice it made directly (great for extra ice needed in a hurry) in your drinks or put in a container in the freezer. Prime Home Ice Maker works very well, makes ice quickly within just a few minutes of plugging it in, runs quietly, looks great, and has a reasonable price tag.